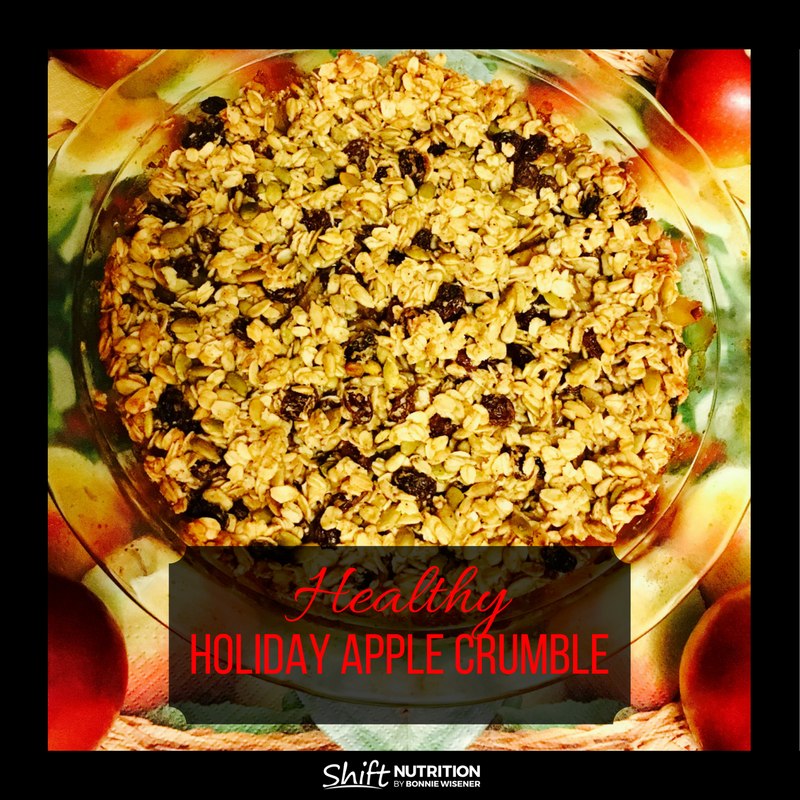 Why not keep it simple this holiday season and bring this gluten-free, delicious and super food’ packed apple crumble to your next family gathering? The pumpkin seeds, chia and hemp hearts give this crumble a boost of fibre. Plus it has no refined sugar, making it appropriate for everyone at your dinner table, even those trying to manage their blood sugar. But it’s the taste that will have adults and kids coming back for seconds. Give this one a try. Easy to make, easy to bring. Enjoy. Pre-heat oven to 375. Lightly grease a 9 x9 or round baking dish. Place apples in a large bowl and add arrowroot powder/potato starch. Toss until combined. Stir in the sugar, chia seeds and cinnamon. Pour the apple mixture into the prepared baking dish. In a large bowl, mix the oats, pumpkin seeds, sunflower seeds, hemp hearts, maple syrup, coconut oil, cinnamon and salt. Add raisins, and stir until well combined. Spread the oat mixture over top of the apple mixture in the baking dish in an even layer. Cover and bake for 45 minutes. Uncover and bake an additional 15 minutes until the topping is golden.